This frustrating awkwardness is a pity, given that going backwards is a relatively important part of my normal, car-driving routine. And, indeed, because the six forward gears can all be selected with a pleasant, buttery smoothness. That’s not to say that changing gear once pointed in the right direction is a joy, because it isn’t. To find out why, simply peer into the footwell, where Mercedes has squeezed in four pedals – accelerator, brake, clutch and parking brake. And there isn’t really room for all of them plus the pair of ham-fisted feet I’ve brought along. Fortunately the parking-brake pedal is mounted too high even for a clot like me to accidentally lock the rear wheels while trying to change gear on a slippery bend, but the misplaced handbrake does still tend to catch at your ankle, a constant nagging reminder that you really ought to have chosen an automatic. The stick-shift gearbox is presumably there so that Mercedes can say the C-Class hits 109g/km on the CO2 scale. 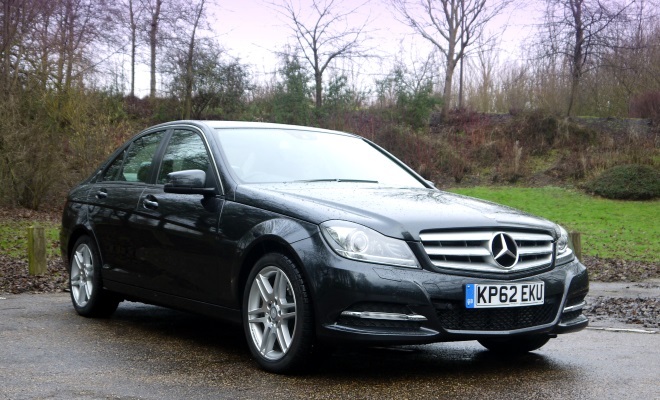 Select the C 220 CDI BlueEfficiency Executive SE with the automatic gearbox it so obviously ought to have, and you’ll spew out slightly more gas at 116g/km. I would suggest that’s a price worth paying. 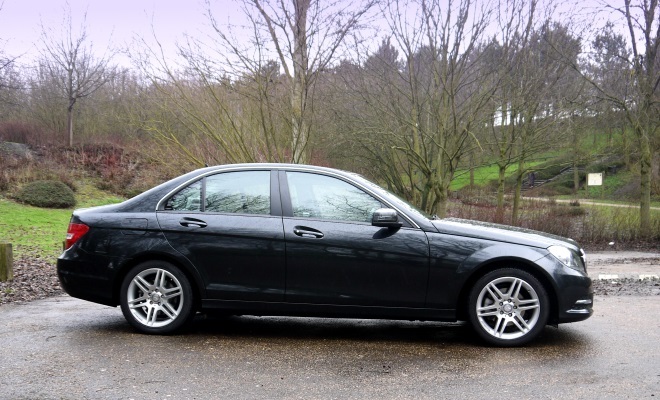 And talking of which, the fiscal outlay will rise from £28,660 for the manual to £30,160 for the auto, but again I would argue that there are not many better ways to invest £1,500 when specifying a Mercedes. Combined cycle figures drop out at 68.9mpg and 64.2mpg for the manual and auto respectively, both of which are pretty good for this class of car. 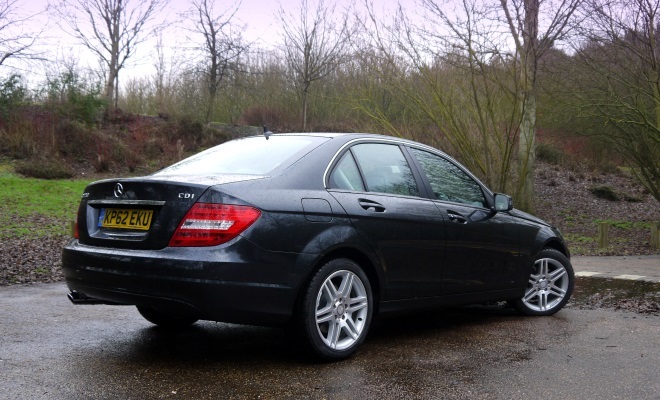 The rest of this particular C 220 CDI seems, perhaps by contrast with the gearbox, rather peachy. 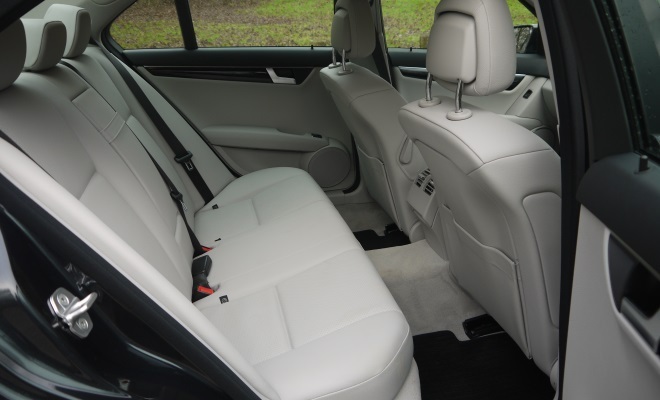 Even the pale grey Artico faux-leather upholstery that comes as standard feels pleasantly soft and persuasive, though I’d personally draw the taste line somewhere before we got to pale grey carpets. At least the mats are practical black. The 2.1-litre, twin-turbo diesel under the bonnet develops 170 horsepower and a prodigious 400Nm of torque, making the car unexpectedly keen to shake a leg. Taking just 8.4 seconds to hit 62mph is not bad for an eco-special, and surprisingly the auto version is three tenths quicker. The steering doesn’t feel sporty, though – it’s much too light and antiseptic – and going up to 10 tenths simply reveals that the diesel engine has a full deck of noise and vibration stuffed up its sleeve. Keep within a more stately rev range and the engine will deal out its torque in a suitably refined fashion, thankfully, though you’ll still feel its shimmy through the gearstick. The engine features a fuel-saving stop-start system, active by default, which can be switched off via an “Eco” button among the neat and tactile little switches that decorate the centre console. Accommodation is excellent up front and not bad in the back, though the rear door apertures felt a little tight to me. The boot holds a useful 475 litres, but mind the lid: it springs open with the force of a medieval trebuchet. The “Comfort” suspension feels suitably soft and pillowy without straying into a bouncy-castle territory, adding to the car’s appeal for those who hold relaxing progress in higher regard than the ability to accurately clip an apex. The cockpit feels particularly inviting, and the circular digital screen in the centre of the three-clock instrument panel provides a host of trip-info options. I’m always pleased to see the ability to simply show speed in big, clear numerals, but there is also a very helpful screen that will show scores for driving efficiency. 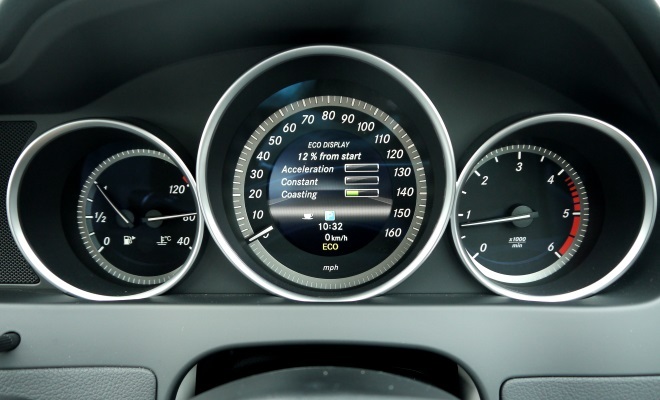 Three simple progress bars give feedback for the eco-qualities of your acceleration, steady-speed running and “coasting” – or slowing without the brake. If my 12% overall score is any guide, I need this feedback more than most. The C-Class is by no means the newest small executive saloon on the market, but it hasn’t been completely left behind by the much fresher BMW 3-Series, which offers an equal 109g/km CO2 score when chosen in 320d Efficient Dynamics guise. The BMW costs roughly the same and is undeniably a more involving car. 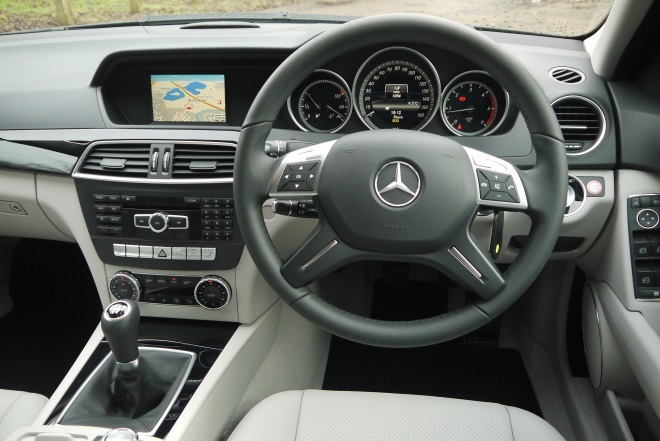 But if you place comfort above driving precision, the Merc is still worth a look – as long as you choose the auto.